We will be hosting a “MCT Global Summit” in October 2018 in Germany. This event is created by MCTs for MCTs, MVPs, Developers and It Professionals worldwide. We will have 122 tracks catering to different topics and round table discussions with experts over 5 days. There will be a test center, a mega event party and much more in addition to the daily sessions. Early bird discount codes available until December 31, 2017 at https://summit2018.global. Get these codes now to secure the early bird pricing. Share this event and pre-registration announcement with your fellow MCTs and MCT communities worldwide. Happy Friday! We are delighted to announce that we have released version 1706 for the Current Branch (CB) of System Center Configuration Manager that includes new features and product enhancements! Configuration Manager makes it easier to adopt and deploy Windows 10 and Office 365. Configuration Manager enables the management of Windows 10 security settings to protect users and company data. Configuration Manager helps customers build the bridge to modern management of Windows to simplify management. Configuration Manager infrastructure is streamlined for simpler and easier use, reducing your total cost of ownership. Microsoft continues to provide iterative value to customers using Configuration Manager connected with Microsoft Intune. Microsoft is committed to delighting our customers by continuing to invest and iterate on Configuration Manager based on customer feedback. We are continuing to see strong adoption by our customers. As of today, we have more than 40,000 organizations managing more than 84 million devices using the Current Branch of Configuration Manager. And thanks to our active Technical Preview Branch community, the 1706 update includes feedback and usage data we have gathered from customers who have installed and road tested our monthly technical previews over the last few months. As always, 1706 has also been tested at scale – by real customers, in real production environments. For more details and to view the full list of new features in this update check out our What’s new in version 1706 of System Center Configuration Manager documentation. For assistance with the upgrade process please post your questions in the Site and Client Deployment forum. To provide feedback or report any issues with the functionality included in this release, please use Connect.If there’s a new feature or enhancement you want us to consider including in future updates, please use the Configuration Manager UserVoice site. …et ce n’est pas tout! Update 1707 for Configuration Manager Technical Preview Branch – Available Now! Client Peer Cache support for express installation files for Windows 10 and Office 365 – Beginning with this release, Peer Cache supports distribution of content express installation files for Windows 10 and of update files for Office 365. No additional configuration or changes are required. Create and run scripts with parameters – You can now create and run scripts with parameters to devices and collections. Configure network definitions using Windows Defender Application Guard policies – You can now configure network definitions using Windows Defender Application Guard policies. These include domain names, IP ranges, cloud resources, and proxy servers. Surface Device Dashboard – You can now use the Surface Device Dashboard to view information about the model and operating system version of your Surface devices. Update 1707 for Technical Preview Branch is available in the Configuration Manager console. 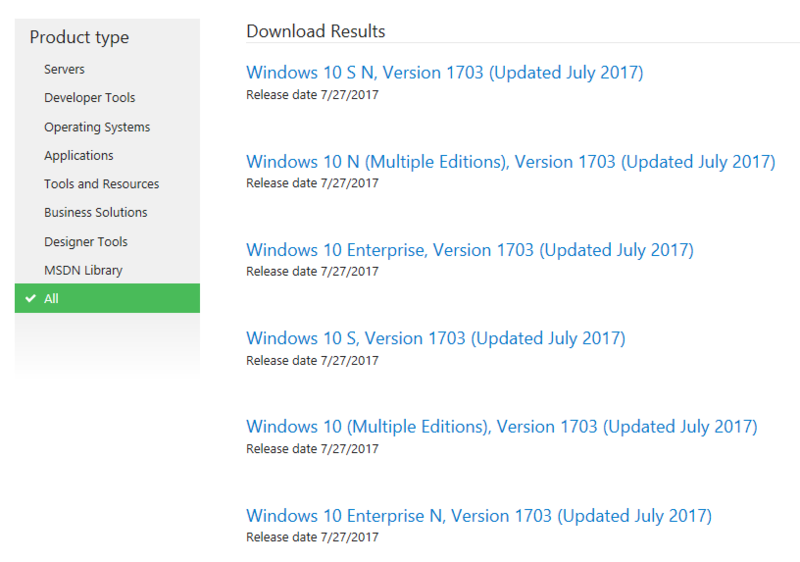 For new installations please use the 1703 baseline version of Configuration Manager Technical Preview Branch available on TechNet Evaluation Center. We would love to hear your thoughts about the latest Technical Preview! To provide feedback or report any issues with the functionality included in this Technical Preview, please use Connect. If there’s a new feature or enhancement you want us to consider for future updates, please use the Configuration Manager UserVoice site. July Updated ISOs are Availables! 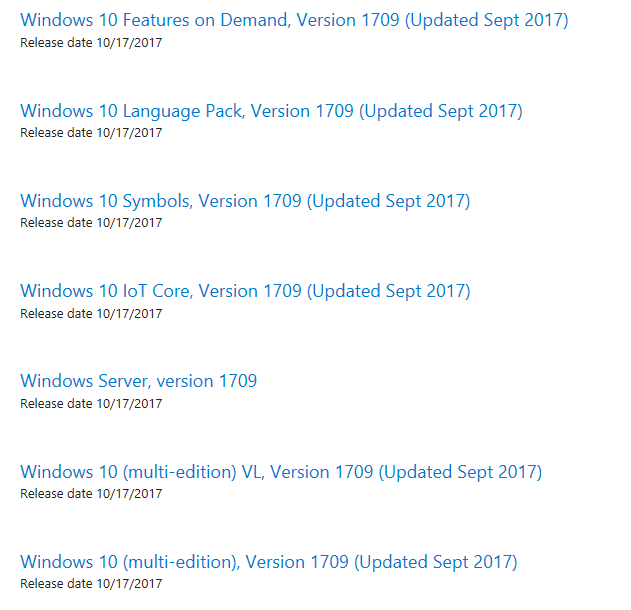 Les ISOs de Windows 10 contenant les mises à jour de Juillet sont téléchargeables sur MSDN! [ENGLISH] Azure Stack is ready to order!!! Orderable Azure Stack integrated systems: We have delivered Azure Stack software to our hardware partners, enabling us to begin the certification process for their integrated systems, with the first systems to begin shipping in September. You can now order integrated systems from Dell EMC, HPE, and Lenovo. Azure Stack software pricing and availability: We have released pricing for the pay-as-you-use and capacity-based models today, you can use that information to plan your purchases. Azure Stack Development Kit (ASDK) availability: ASDK, the free single-server deployment option for trial purposes, is available for web download today. You can use it to build and validate your applications for integrated systems deployments. Azure Stack is an extension of Azure, thereby enabling a truly consistent hybrid cloud platform. Consistency removes hybrid cloud complexity, which helps you maximize your investments across cloud and on-premises environments. Consistency enables you to build and deploy applications using the exact same approach – same APIs, same DevOps tools, same portal – leading to increased developer productivity. Consistency enables you to develop cloud applications faster by building on Azure Marketplace application components. Consistency enables you to confidently invest in people and processes knowing that those are fully transferable. The ability to run consistent Azure services on-premises gets you full flexibility to decide where applications and workloads should reside. An integrated systems-based delivery model ensures that you can focus on what matters to your business (i.e., your applications), while also enabling us to deliver Azure innovation to you faster. In its initial release, Azure Stack includes a core set of Azure services, DevOps tooling, and Azure Marketplace content, all of which are delivered through an integrated systems approach. Check out this whitepaper for more information about what capabilities are available in Azure Stack at the initial release and what is planned for future versions. Edge and disconnected solutions: You can address latency and connectivity requirements by processing data locally in Azure Stack and then aggregating in Azure for further analytics, with common application logic across both. We’re seeing lots of interest in this Edge scenario across different contexts, including factory floor, cruise ships, and mine shafts. Cloud applications that meet varied regulations: You can develop and deploy applications in Azure, with full flexibility to deploy on-premises on Azure Stack to meet regulatory or policy requirements, with no code changes needed. Many customers are looking to deploy different instances of the same application – for example, a global audit or financial reporting app – to Azure or Azure Stack, based on business and technical requirements. While Azure meets most requirements, Azure Stack enables on-premises deployments in locations where it’s needed. Saxo Bank is a great example of an organization who plan to leverage the deployment flexibility enabled by Azure Stack. Cloud application model on-premises: You can use Azure web and mobile services, containers, serverless, and microservice architectures to update and extend existing applications or build new ones. You can use consistent DevOps processes across Azure in the cloud and Azure Stack on-premises. We’re seeing broad interest in application modernization, including for core mission-critical applications. Mitsui is a great example of an organization planning their application modernization roadmap using Azure Stack and Azure. Our goal is to ensure that most ISV applications and services that are certified for Azure will work on Azure Stack. Multiple ISVs, including Bitnami, Docker, Kemp Technologies, Pivotal Cloud Foundry, Red Hat Enterprise Linux, and SUSE Linux, are working to make their solutions available on Azure Stack. You have the option of having Azure Stack delivered and operated as a fully managed service. Multiple partners, including Avanade, Daisy, Evry, Rackspace, and Tieto, are working to deliver managed service offerings across Azure and Azure Stack. These partners have been delivering managed services for Azure via the Cloud Solution Provider (CSP) program and are now extending their offerings to include hybrid solutions. Systems Integrators (SI) can help you accelerate your application modernization initiatives by bringing in-depth Azure skillsets, domain and industry knowledge, and process expertise (e.g., DevOps). PriceWaterhouseCoopers (PwC) is a great example of an SI that’s expanding their consulting practice to Azure and Azure Stack. Azure Stack integrated systems – These are multi-server systems meant for production use, and are designed to get you up and running quickly. Depending upon your hardware preferences, you can choose integrated systems from Dell EMC, HPE, and Lenovo (with Cisco and Huawei following later). You can now explore these certified hardware solutions and order integrated systems by contacting our hardware partners. These systems come ready to run and offer consistent, end-to-end customer support no matter who you call. They will initially be available in 46 countries covering key markets across the world. Azure Stack Development Kit (ASDK) – ASDK is a free single server deployment that’s designed for trial and proof of concept purposes. ASDK is available for web download today, and you can use it to prototype your applications. The portal, Azure services, DevOps tools, and Marketplace content are the same across this ASDK release and integrated systems, so applications built against the ASDK will work when deployed to a multi-server system. As an extension of Azure, Azure Stack will deliver continuous innovation with frequent updates following the initial release. These updates will help us deliver enriched hybrid application use cases, as well as grow the infrastructure footprint of Azure Stack. We will also continue to broaden the Azure ecosystem to enable additional choice and flexibility for you. 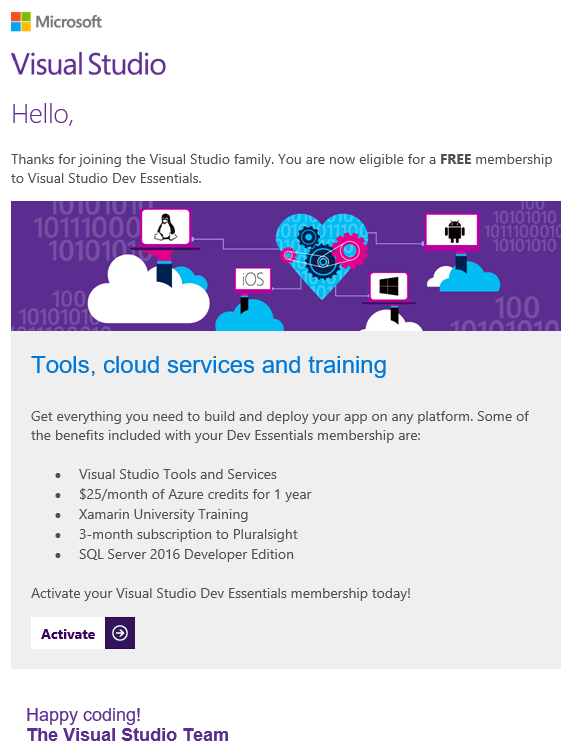 I look forward to hearing what everyone does with Azure Stack! News from Yvette, again, and again, and again! Import updates from external catalogs (non-Microsoft update catalogs). Modify update definitions including applicability, and deployment metadata. Export updates to external catalogs. Publish updates to an update server. This SCUP preview adds support for Windows 10 and Windows Server 2016. Users who are familiar with SCUP 2011 will be able to easily use the preview on Windows 10 and Windows Server 2016 systems as there are no major changes to the way the SCUP works. Download the SCUP Preview here. Run UpdatesPublisher.msi on a computer that meets the prerequisites. Configure the options for SCUP. Start using the features of SCUP. For a walkthrough of these steps please read our System Center Updates Publisher documentation. We would love to hear your feedback. If you have a feature request, share your ideas with us on the Configuration Manager UserVoice site. You can report issues with SCUP on Connect or reach out to us directly at Scupfeedback@microsoft.com. Q. Does this release include SCUP integration with the Configuration Manager Console? A. This preview is to enable SCUP 2011 features on our newest OSes and is not directly related to work that is planned for Configuration Manager Console Integration. For the latest news about that, please see the UserVoice item here. Q. Can I use this preview release with Windows 7 or WSUS 3.x? A. Windows 7 and WSUS 3.x are not supported with this release. Please continue to use SCUP 2011. Q. Does this preview release support upgrade from SCUP 2011? A. For Windows 8.1 and Server 2012 R2 systems that have SCUP 2011 installed, installation of the preview will not uninstall or interfere with the existing SCUP 2011 installation. On these systems, you may continue to use SCUP 2011 or use the preview version, however the two installations will not share data.